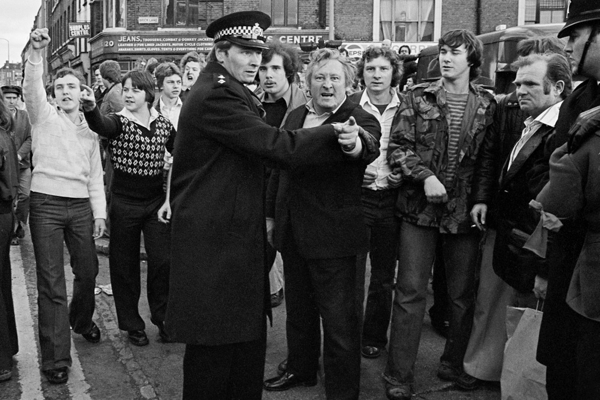 Here are the East Enders of the nineteen seventies as pictured by photographer Tony Bock in the days when he worked for the East London Advertiser – the poncey dignitaries, the comb-over tories, the kids on the street, the market porters, the fascists, the anti-fascists, the shopkeepers, the sheet metal workers, the unions, the management, the lone dancers, the Saturday shoppers, the Saturday drinkers, the loving family, the West Ham supporters, the late bride, the wedding photographer, the clock winder, the Guinness tippler, the solitary clown, the kneeling politician and the pie & mash shop cat. Dignitaries await the arrival of the Queen Mother at Toynbee Hall. 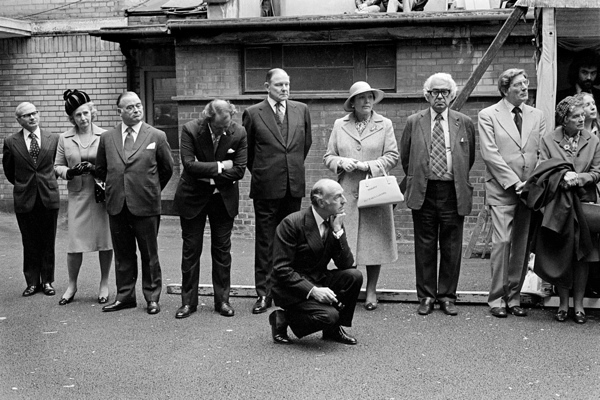 John Profumo kneels. 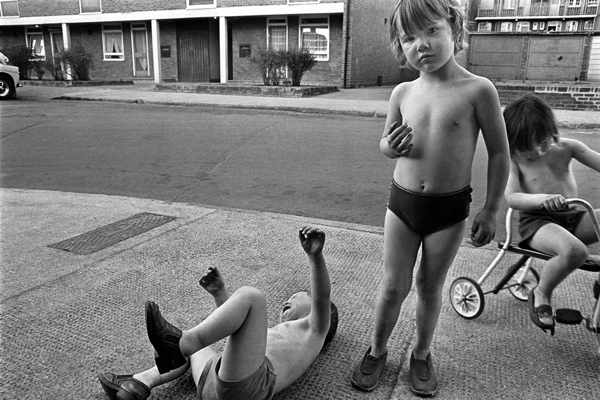 Children playing on the street in Poplar. On the steps of St Paul’s Cathedral. National Front supporters gather at Brick Lane. Watching a National Front march in Hackney. 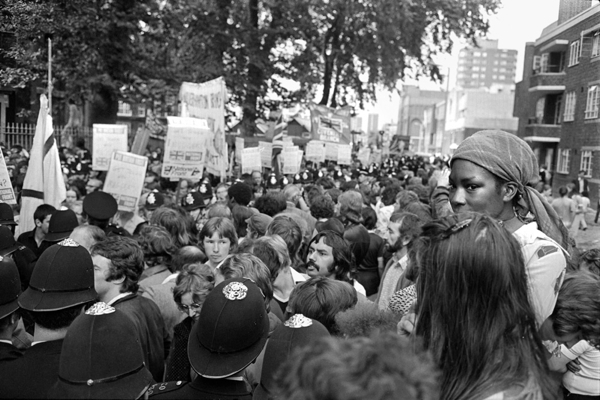 Shopkeepers come out to watch an anti-racism march in Hackney. A family in Stratford pose in their back yard. 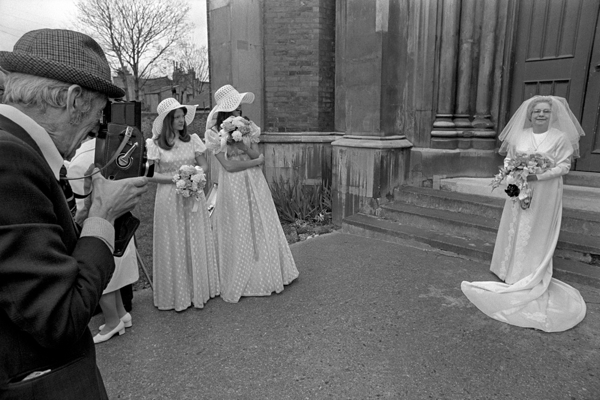 Wedding photographer in Hackney – the couple had been engaged many years. 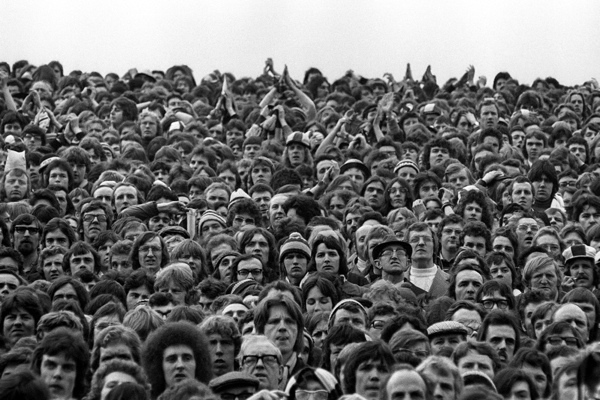 West Ham fans at Upton Park, not a woman to be seen. 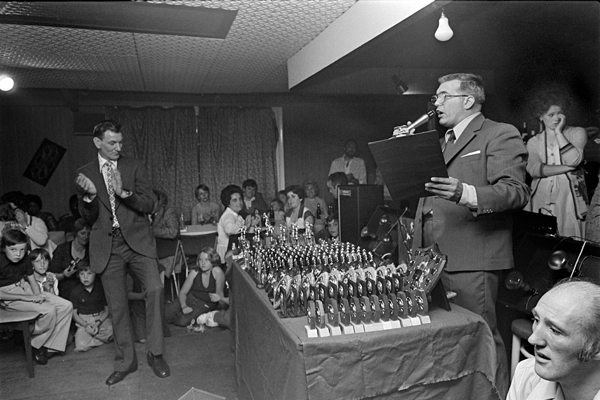 Sports club awards night in Hackney. 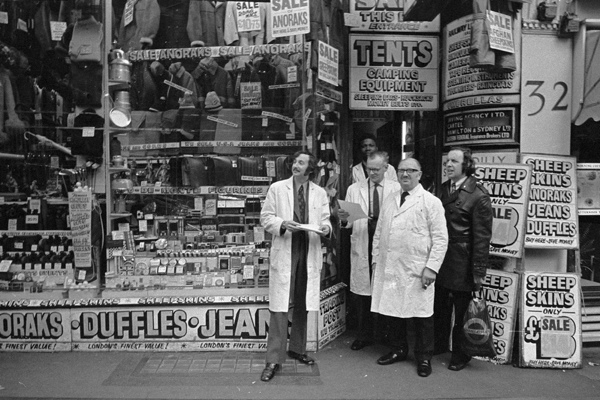 Conservative party workers in the 1974 electoral campaign, Ilford. 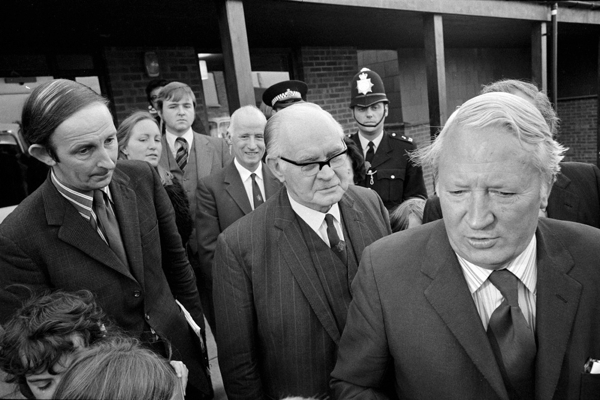 Ted Heath campaigns in Ilford for the General Election of 1974. Ford workers union meeting, Dagenham. 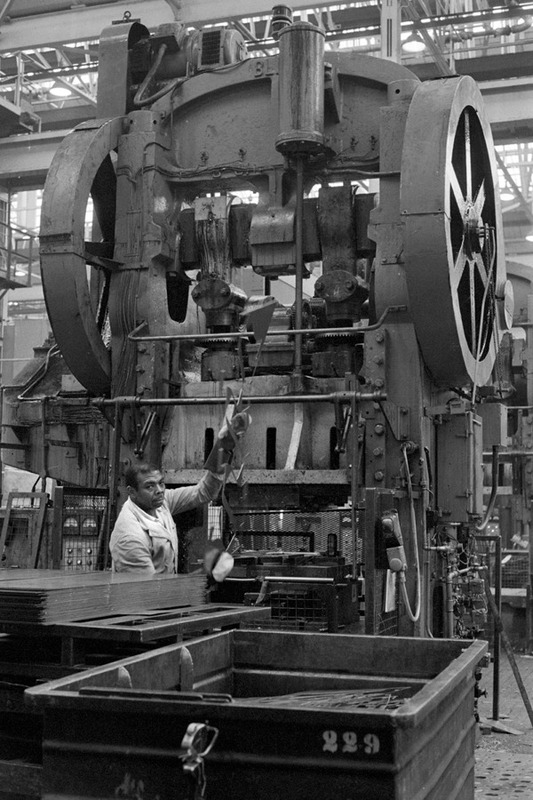 Press operator at Ford plant, Dagenham. At Speakers’ Corner, Hyde Park. 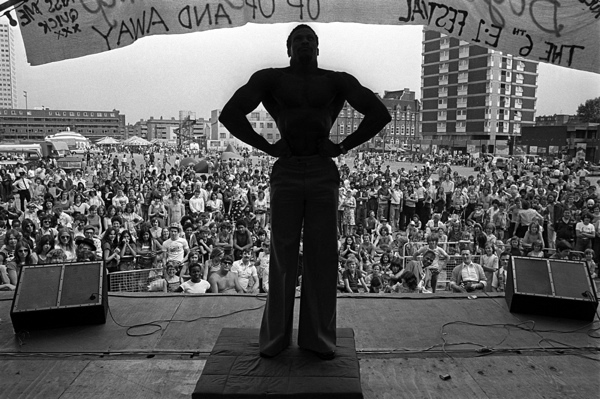 Mr East End Contest at E1 Festival. 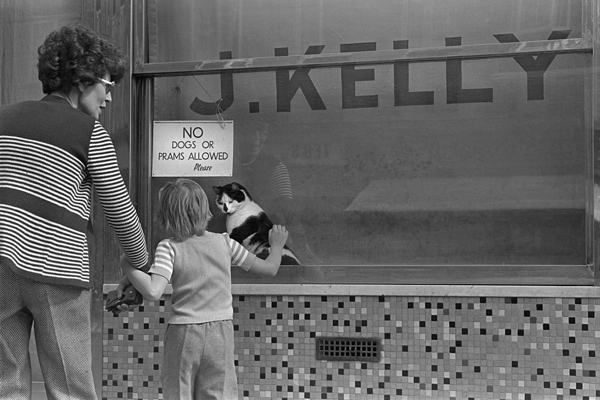 The shop cat at Kelly’s Pie & Mash Shop, Bethnal Green Rd. At the White Swan in Poplar. 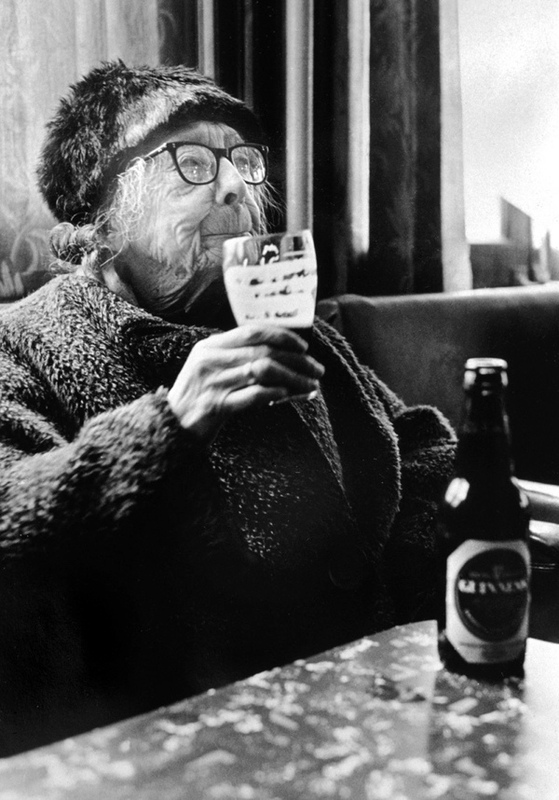 Enjoying a Guinness in the Royal Oak, Bethnal Green. 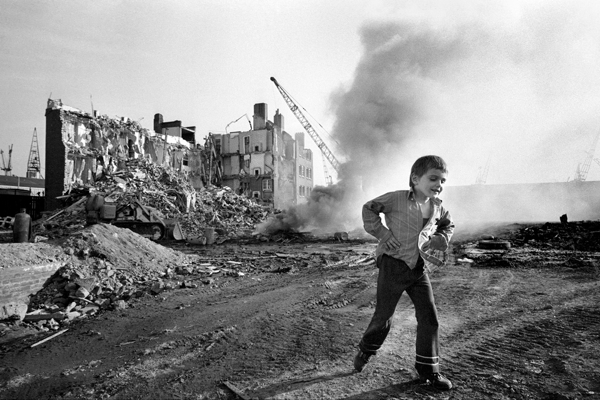 Boy on demolition site, Tiller Rd, Isle of Dogs. Saturday morning at Roman Rd Market. 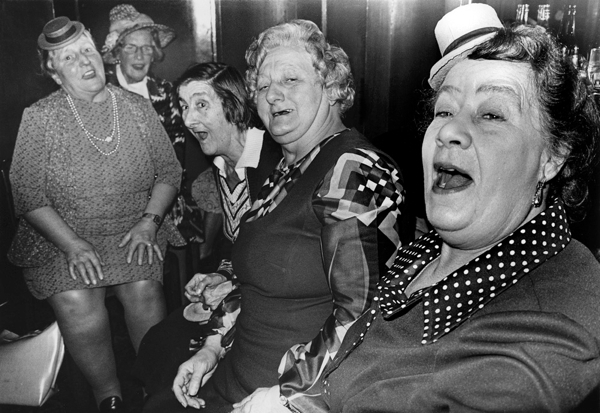 Saturday night out in Dagenham. So many memories here. 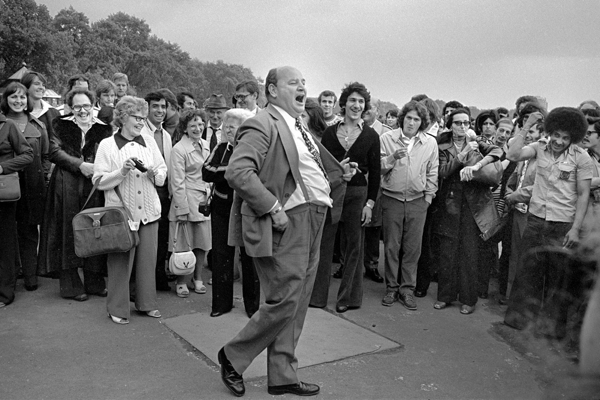 There’s Ian Mikardo (whose tie is wearing him in the Toynbee Hall photo). 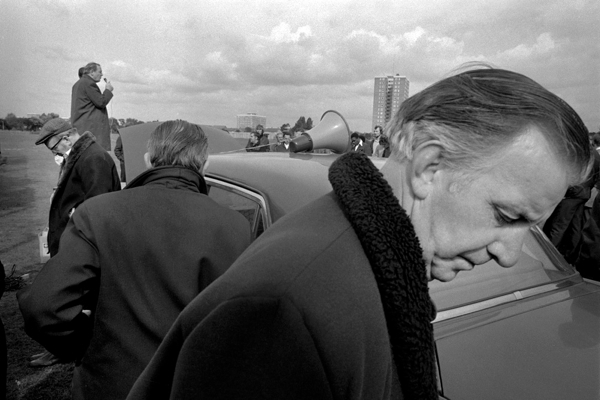 Anyone who watched Feb 14th’s Harold Wilson night on the BBC parliament channel will have been transported back to the times so vividly displayed here. 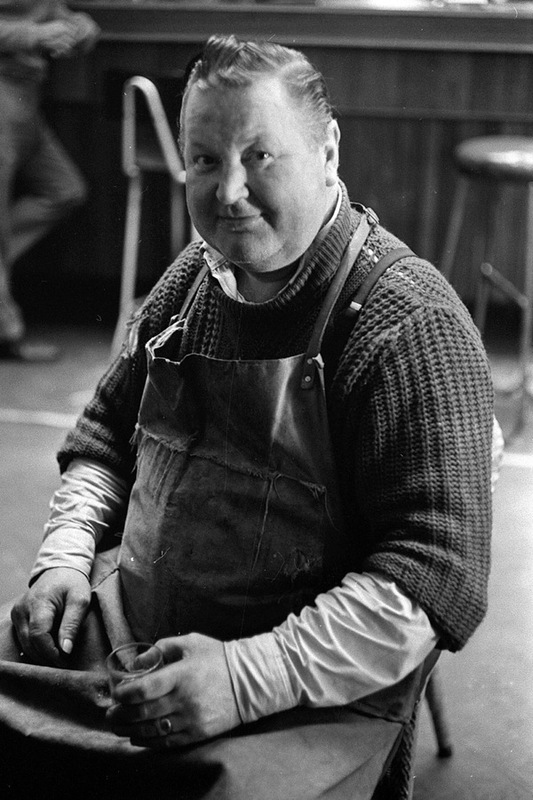 Most of my extended family worked at Fords (having left Cork to do so) and so those pictures feel very familiar. The anti-fascist movement – I remember my dad’s horror when my teenage self came home from a Tom Robinson concert in Lewisham wearing a ‘Gays against the Nazis’ badge. And I remember taking part in a Scottish dancing display at the E1 festival. Better get on with the here and now! 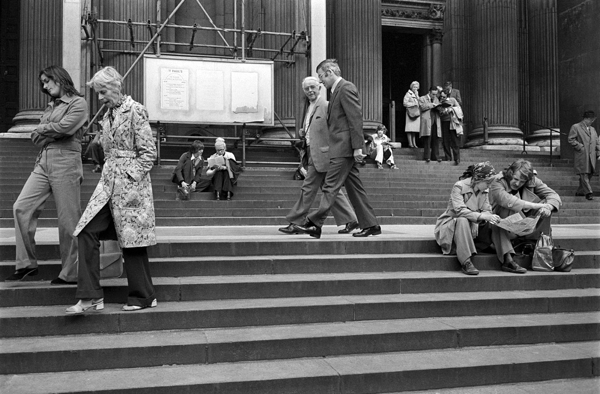 These are wonderful and evocative photographs and beautifully observed. Beautiful… Real Innocence exists in the east end. These people have a courage unmatched anywhere else in the country. 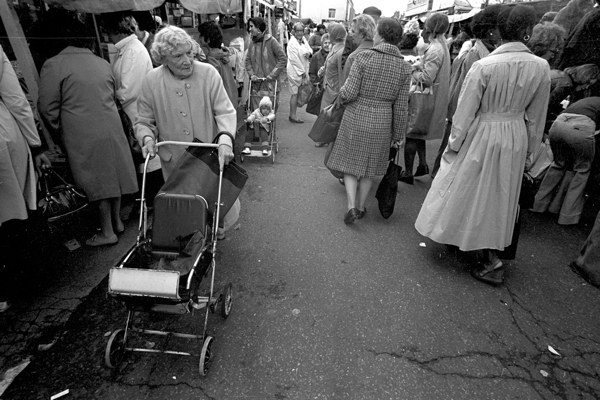 It is interesting to see the shopper in the Roman with an old pushchair, the precursor to the shopping trolley, and to see old “Mik” our much loved but forgotten MP. As a former East End boy I can tell you I’m really enjoying your pictures keep it up. 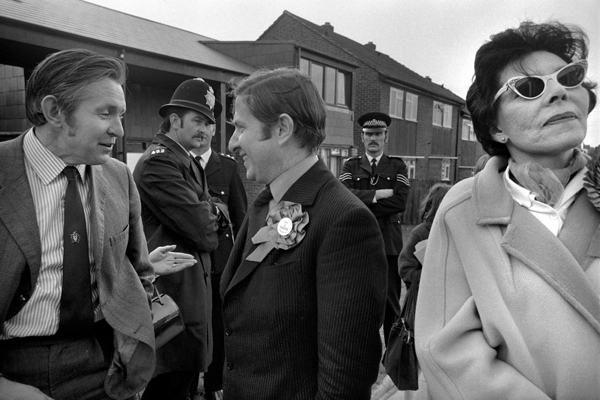 I can remember being in Essex to visit my sister back in the 70s, she lived in Goodmayes at the time. A friend of hers took me to Brick Lane Market on the Sunday and unfortunately we turned the corner and walked right into a National Front demo which was about to get nasty. As a 17 year old from a Scottish backwater I was terrified. On another note, I need to have a good look at all the faces in the West Ham photo as I think my husband could be in it! One of the many characters I used to encounter, on my early morning daily buying visits to Spitalfields Fruit Flower and Vegetable Market. 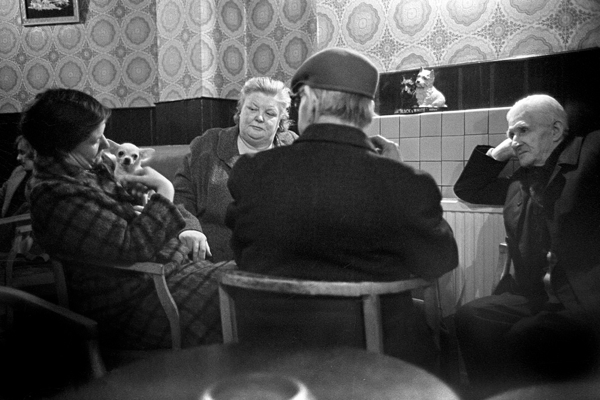 Many an early morning pint has been shared in the company of such characters, who made the market such a lively atmosphereic and facinating place to conduct your daily business. There were several early morning “watering stops” The Gun PH, The Ten Bells, PH The Golden, Hart PH, and the Vesta Tilley Club where you could buy a great steak sanwich, to eat with your pint. A few memories – sharing a platform with Tom Robinson at an Anti-Fascist League Demo before marching to Victoria Park, the football match (standing in a crowd of 66,000 at Stamford Bridge – a disaster waiting to happen!) and the styles! 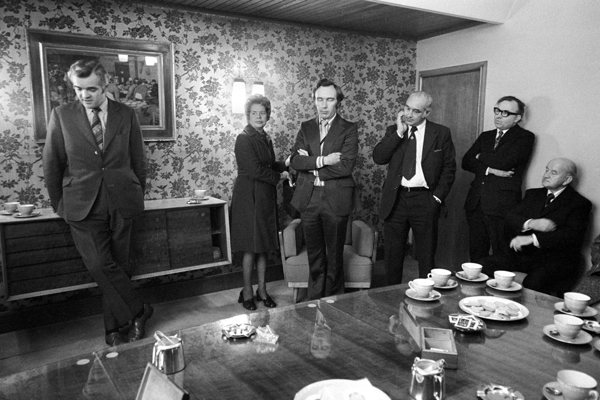 I also think there are a couple of clones here: Margaret Thatcher (first photo), Eric Idle (the shopkeepers) or is it Private Walker from Dad’s Army? Great photos! I favorites are the Dancers at Victoria Park & The Clown. 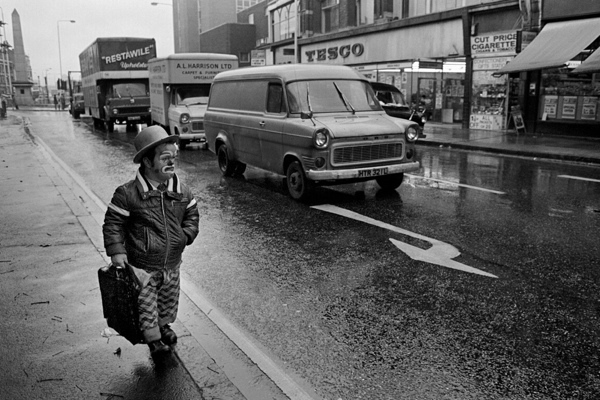 These evocative photographs bring back memories of my first visit to England, a three-month stay in 1978. While I was familiar with rural Appalachia and East Coast inner cities in the US, nothing prepared me for the Dickensian spectacle of Sunday morning on Brick Lane — hawkers under the Shoreditch tube station tracks, animals in cages, masses of people shopping their way through bits of broken bicycles and used clothing. 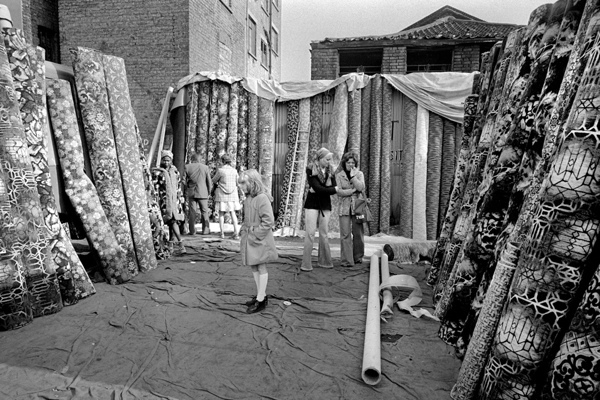 It is very hard to conjure up those memories walking down Brick Lane in 2013 so these photos are especially enjoyable. 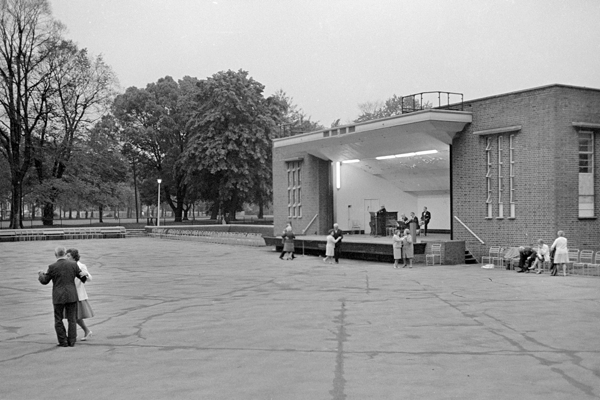 Victoria Park was my playground as a child (we lived in a council flat nearby) and this photograph of the dancers brings back wonderful memories as I roller skated there and watched the dancing. Thank you sincerely for publishing this picture – I am going to keep it. Wonderful images, restoring faith in the great documentary tradition. 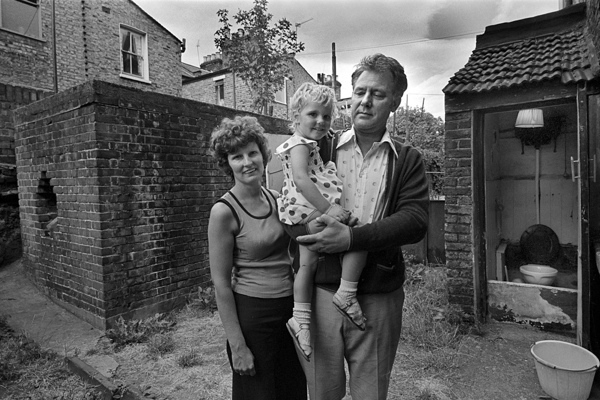 great photos the cockneys are the salt of the earth ,nice to see them remembered like this . I hope that some people are still taking photographs with black and white film ,so the future generations can look back at there past . thanks tony, I am still using film mostly b/w and have my own website its http://www.essexcockney.com please have a look ,and leave a comment ..
My dad owned the vesta Tilley club I spent most of my childhood there, amazing times the porters would take me around on their floats. 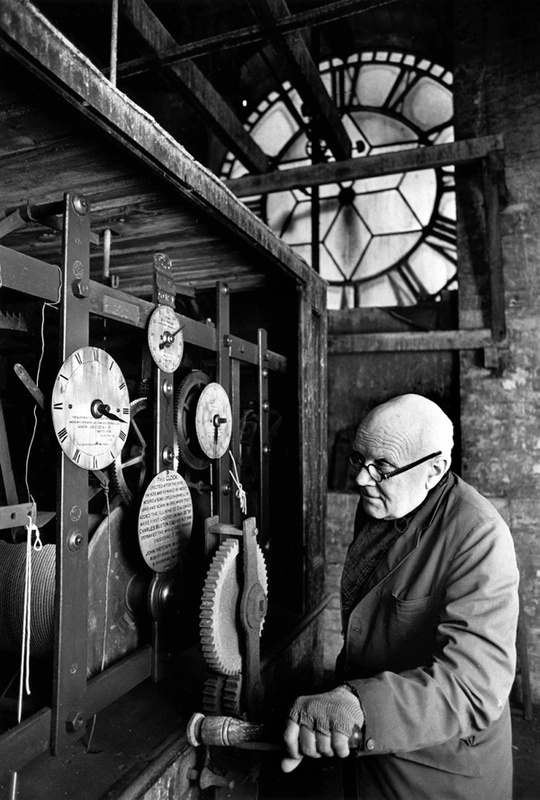 The clockwinder is David Grainger, ordained very late in life by the then Bishop of Southwark, Mervyn Stockwood. David also looked after the bishop’s clocks. He was an Assistant Priest at St John Waterloo until his death.